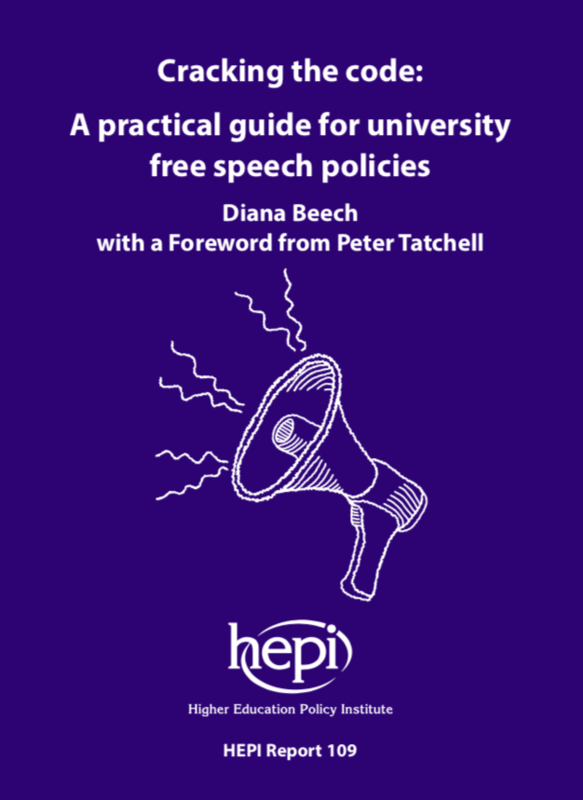 The Higher Education Policy Institute (HEPI) has today published a new report on free speech with a Foreword by human rights campaigner Peter Tatchell. The report serves as a practical guide to help higher education institutions secure freedom of speech on campus. As debates roll on about whether free speech is being unduly restricted on university premises throughout the UK, attention is turning to the mechanisms higher education institutions have in place to safeguard external speakers and events. For universities and colleges in England and Wales, these include mandatory codes of practice to protect freedom of speech. Yet, with no set guidelines for these codes of practice, some policies have recently been dubbed overly bureaucratic, too complex and off-putting. Based on a close examination of existing codes, Cracking the code: A practical guide for university free speech policies provides advice to higher education institutions on what works, as well as what does not. not linking to necessary supplementary materials such as room booking forms and risk assessment protocols. This new guide is intended to assist university boards and committees when formulating or updating codes of practice on freedom of speech to ensure policies are as efficient and user-friendly as possible. Free speech has long been at the heart of higher education. The duty to protect it is about much more than adhering to legal protocol, but preserving the essence of university life. We are now living in an age where student populations are diversifying fast and digital technologies are enabling new forms of communication. This presents fresh challenges for institutions, with more voices to be heard and more ways of hearing them. Against this complex backdrop, it is more important than ever that universities and colleges put in place codes of practice to ensure freedom of speech thrives. This guide helps institutions to optimise free speech policies to ensure different ideas continue to be expressed and debated within the law. Codes of practice should always facilitate free speech, not frustrate it. I welcome this report, which offers institutions some practical guidance on what good codes of practice look like. The right to free speech is hard won and not always easy to protect. This report helps us to protect it. As the UK faces the challenges of Brexit, right-wing populism, Islamist extremism and the demands of marginalised communities like trans people, free and open debate on all issues will become more important than ever. And universities and students have a vital, precious role to play in these debates. Things I have seen in British Universities in the Last 2 years. Not singling one out, especially mine. 1. Adminstrators insisting course titles are changed to their preferred title, despite having no expertise in the field. 12. The obligation to produce my passport to universities paying me below the minimum wage so they can leverage my reputation and ’employ’ me as an external examiner. Peter Tatchell, you have lost a great fan here.